Put vegetables into food processor with a blade and process until finely diced. Turn on high and when hot add soup then turn down low and cook for at least 5 hours. I usually make at night and let cook over night. 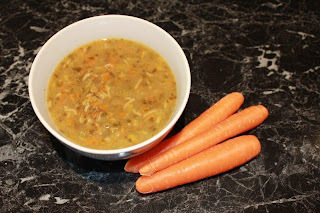 Makes a thick hearty soup with not too much spice for kids to eat. Recipe Total: 781 calories Makes approx 4 1/2 litres. This looks delicious. Thank you for sharing. I will make it up over the weekend - it will be perfect for the cold winter nights we are having.